Are there some foods that you eat where you don’t seem to have an off switch? Mine is pizza. Gourmet woodfired crunchy based pizza. Once upon a time, in my reckless years, this was a weekend staple, whether I made it at home or let a worthy establishment do it for me. Making wellness decisions to limit my gluten and dairy intake had regretfully put a stop to that weekly indulgence. However, nowadays there are plenty of gluten free and paleo alternatives to our “old school” fast foods options and when it comes to pizza, I have tested a fair few. From cauliflower pizza bases to pre-made pizza mixes. This week, I had a play with Gluten Free Food Co’s Quick Mix Pizza Base with very tasty results. Gluten Free Food Co are an Australian company that creates a whole range of yummy vegan baking mixes from breads to the sweeter stuff using organic ingredients. 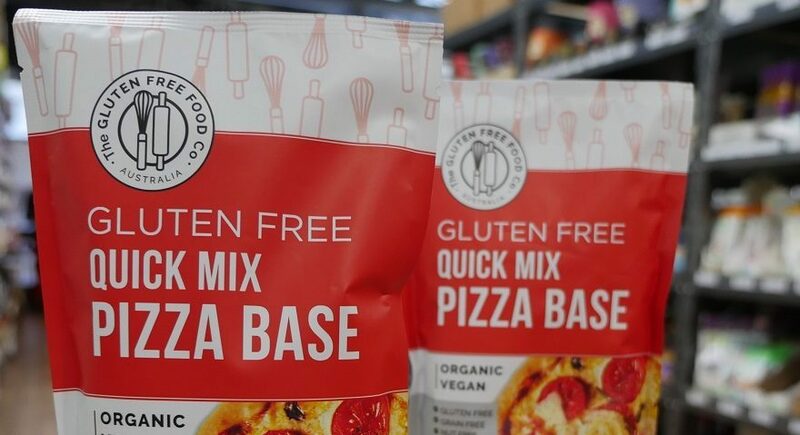 The pizza base mix consists of coconut flour, buckwheat flour, golden flaxseed flour, psyllium, Australian green banana flour, tapioca, black chia seed, baking powder, Kfibre ™ and yeast. It ticks all the boxes by being not only gluten free but grain, egg, dairy, nut and soy free. A very allergy friendly easy meal alternative with a nutritional boost from ingredients such as chia, banana flour and flaxseeds. All you need to add is water and olive oil to make the dough and away you go. I like my pizza bases quite crunchy so I prebaked them about 5 minutes longer than the suggested 10 minutes. The recommended baking time of 10-15 minutes with toppings was spot on. Essentially, this quick mix base means that you can spend more time on creating your favourite healthy toppings. The mix of ingredients does not compromise on flavour either. The base performs like a normal pizza base (in that it holds together well with a pile of toppings), has a crunchy texture (which I love) and a flavour that does not overpower your toppings. We tried a couple of topping combinations – Roasted Sweet Potato, Broccoli and Goats Cheese and Roasted Pumpkin and Zucchini with Cashew Cheese and Hemp Pesto. You can find the recipes here and here. After a serious discussion was had about which was the tastiest combination, there was no clear winner. A good excuse for a second go next weekend! The final verdict on the base? If you have tried any of the other Gluten Free Food Co mixes you will know they create a product that uses clean, quality ingredients and is a very tasty healthy alternative to the conventional versions. 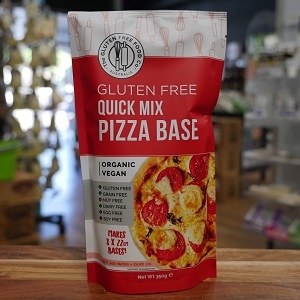 The pizza mix base is definitely another quality Gluten Free Food Co product. For me? Let’s just say, the weekly pizza indulgence may no longer be a thing of the past….